Exotic flowers, beautiful women, and crystal blue beaches all compliment the Thai Paradise Slot. Designed by the Playtech software company, the game atmosphere makes you feel like you’re on vacation. 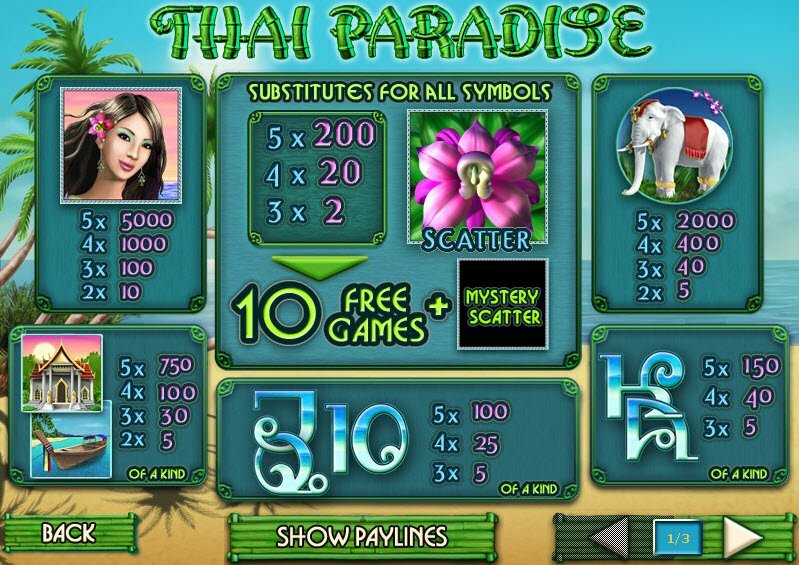 Thai Paradise Slot Bonuses give Free Games, Mystery Scatters, and Multipliers. Playing Thai Paradise Slot transports you to an exotic getaway in Southeast Asia. The slot machine contains 5 reels and 15 paylines. During the Free Games feature, you win 10 Free Games with a Mystery Scatter. The Mystery Scatter shows up randomly and multiplies the payout by the total bet. You can even win more Free Games during the spins. Magenta orchids, sea foam green beach fronts, impressive elephants, and lovely Thai ladies all decorate the reels. The icon with the boat makes me want to step inside and row out into the crystal blue water. Tropical music plays to compliment the game’s exotic theme. The colorful graphics add charm and appeal to the game. 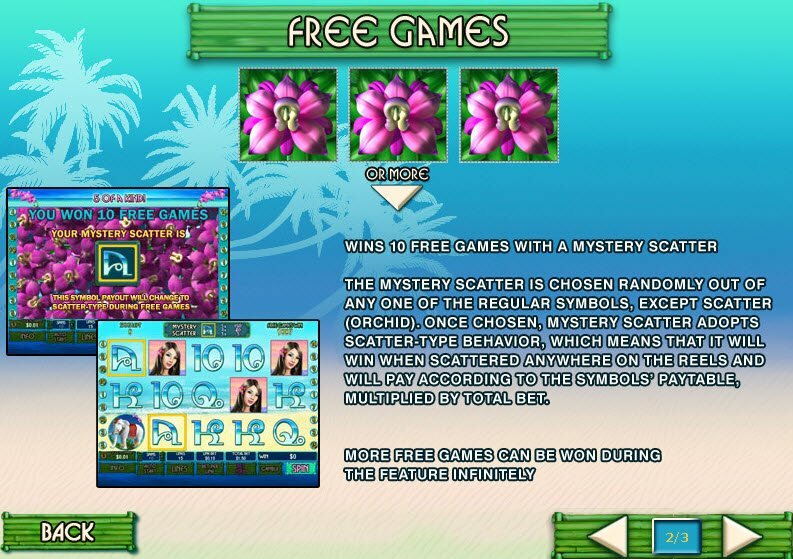 When 3 or more of the Orchid Symbols appear on the reels, you win 10 Free Games with a Mystery Scatter. The Mystery Scatter shows up randomly and multiplies the payout by the total bet. You can even win more Free Games during this Bonus Feature. 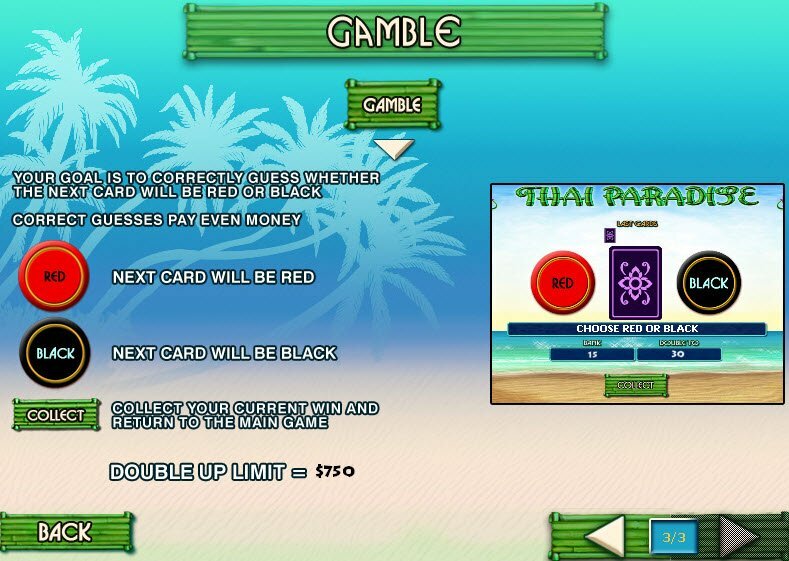 Thai Paradise Slot Bonuses award Free Games, Mystery Scatters, and Multipliers. When 3 or more of the Orchid Symbols appear on the reels, the game enters the Free Games Mode. Automatically you win 10 Free Games with a Mystery Scatter. The Mystery Scatter shows up randomly and multiplies the payout by the total bet. You can even win more Free Games during this Bonus Feature. After each winning combination, players also have the opportunity to bet their winnings in the Gamble Round. If you correctly guess the color of the next card, you can double your money. Really nice graphics. It’s one of those slots that feels like an escape when you play it.